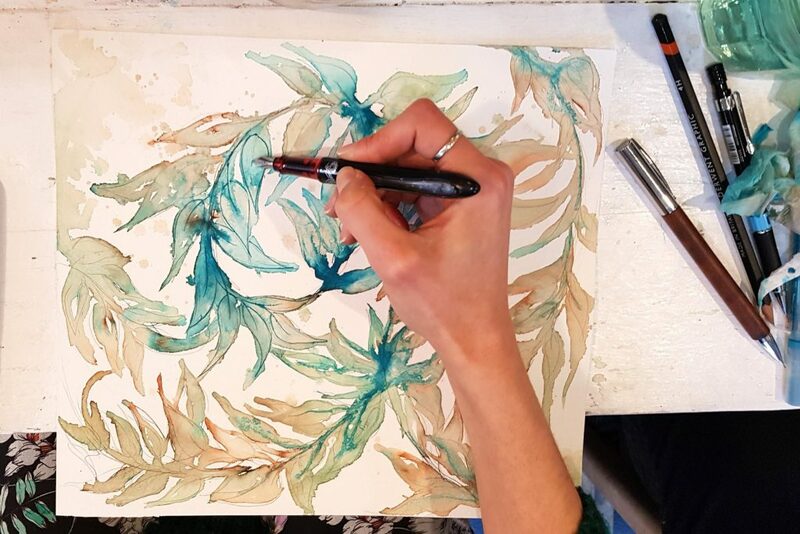 Recently I was fortunate enough to hold two workshops at Laura Lea Design in Leytonstone London to celebrate the launch of my new book The Organic Painter. The Organic Painter is my first attempt to record some of the processes I use to explore media within my work. The book contains a series of bite-sized projects designed to help you limber up and approach your work in a free and experimental kind of way – utilising materials that you may have to hand and helping you to gain the confidence to experiment freely with new materials. Using one of the book’s projects as a starting point and working with a small group of 10 creatives from varying backgrounds. We talked about our approaches to art and the way we were going to explore media in this particular exercise. The workshop was designed to approach a similar exercise in two different ways – the first was to use chaos as a starting point for an image. 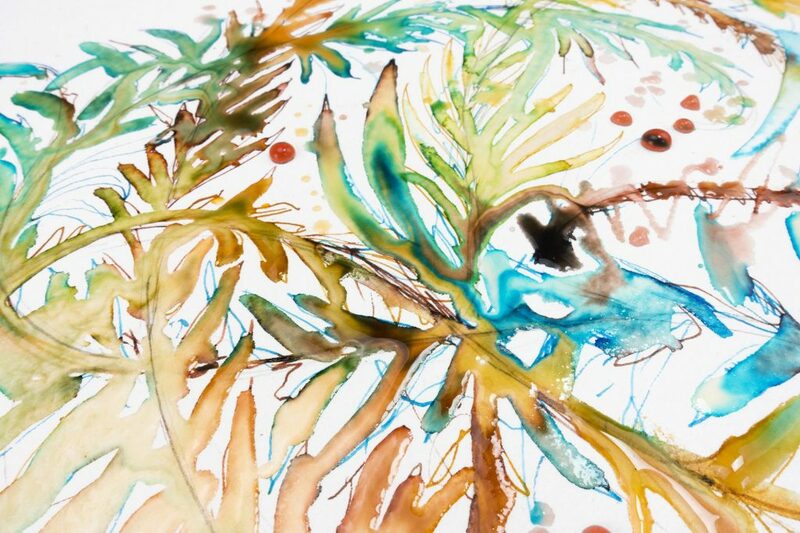 The Second was to start with a pencil drawing and then create liquid channels to allow colour to run throughout the work. The first process involved laying down layers of ink on the page, quite randomly which were then added to and disturbed by various liquids. 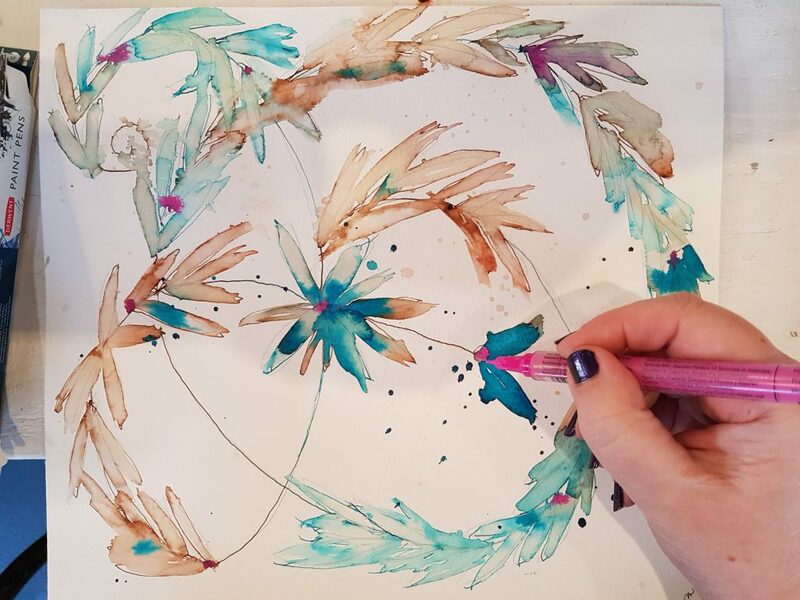 We used teas, gin and vodka to create blooms of colour from the inks and using pigment pens we dripped and splattered colour onto the surface of the liquids to allow them to disperse in the work. 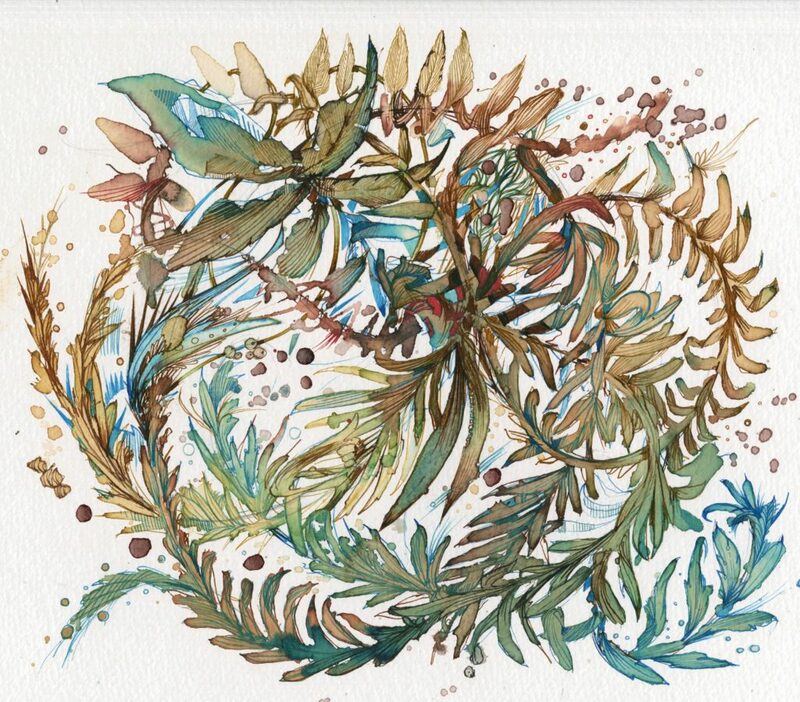 During the second process we created a sprig of flora using graphite then water soluble calligraphy inks which were then added to with a mixture of the teas, inks and alcohols. 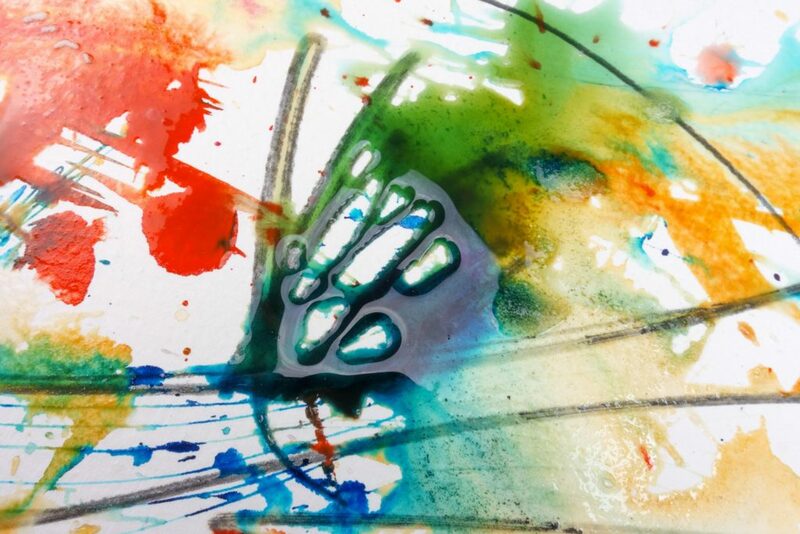 When there was sufficient liquid on the page, we used the Derwent Paint Pens to add colour into the wet liquid and allowed it to bleed throughout the work. One of the advantages of working with Derwent’s paint pens is that they perform well as both wet and dry media tools and in both an expressive and controlled way. 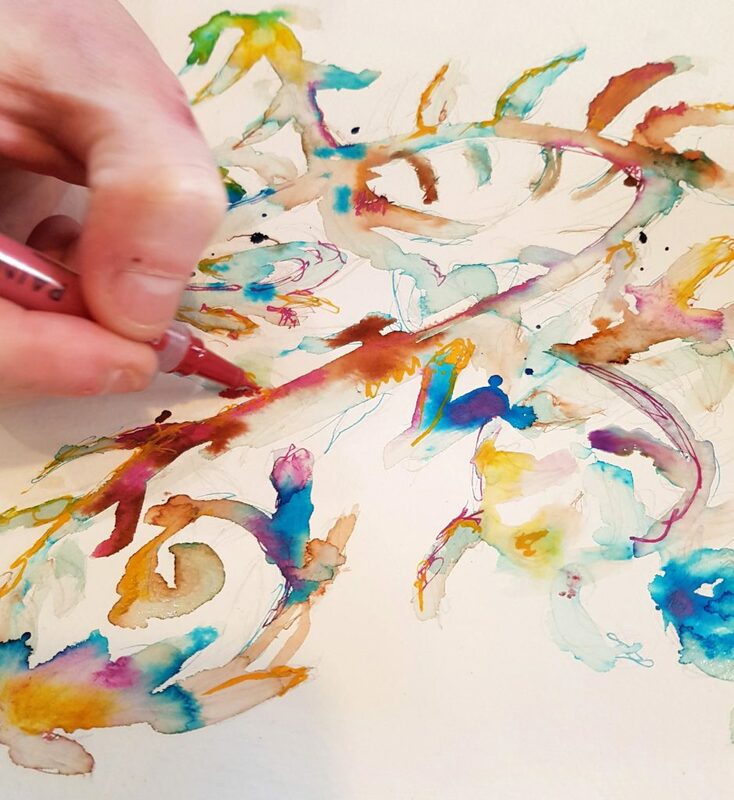 As well as providing colour bursts and runs for the underpainting – the pens were also used to add line detail over the top of the work and build up layers. The opaque nature of the paint when dry allows lighter colours to be added over dark, something that is not possible with the translucent inks that I use. Adding colour into wet media using Derwent’s Paint Pen. Carne’s book The Organic Painter is available on Amazon now for £11.78.